We can say unequivocally that a rapid succession of emotionally intense events is hard on the system. Linda and I are beat. Two weeks ago the community gathered for the memorial services for our four lost friends here in San Pablo. Last week was Abby and Matt’s wedding in Indiana. Last night on the return to Oaxaca our plane was struck by lightning. And today is Mexican Independence Day. ¡Viva la vida! ¡Viva el amor! ¡Viva México! Thursday the 3rd was the memorial at Casa Raab for Jeff Charles and Bill and Doreen Stair. The Sala Grande in Rebecca and Tony Raab’s compound is adjacent to a covered terrace and a patio surrounding a swimming pool. It is the center of their B&B casita business and often they have used it to host community events. A table at the back of the Sala Grande groaned with platters of finger food brought by the mourners to the event: veggie plates, salads, dips, cookies, cakes. A table on the terrace was stocked with drinks. 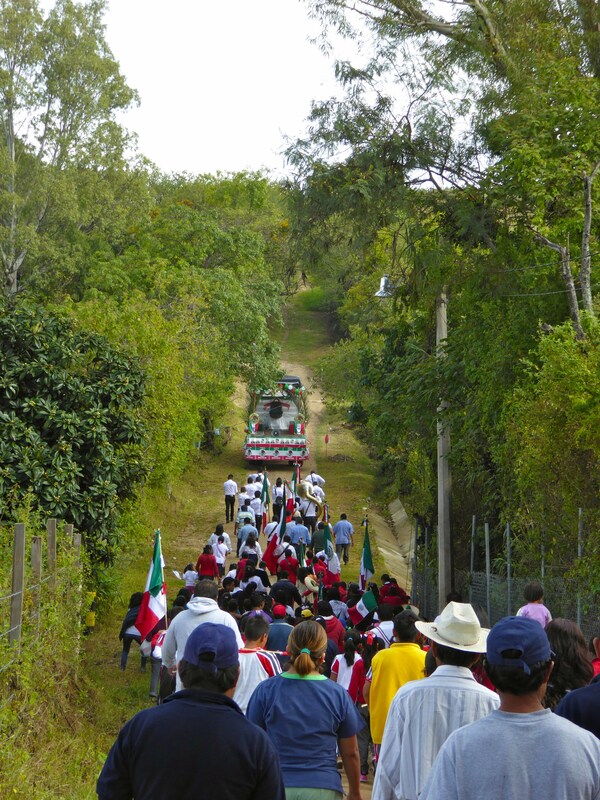 About a hundred friends of the deceased, members of the Mexican and expat communities of San Pablo, San Sebastián, and San Agustín, three neighboring towns on the east side of the Etla Valley where all of the victims had lived, came to express their regrets, mingle with friends, and to bolster the sense of solidarity in the communities. At the far end of the Sala the Bodega Boys, minus the lead bass, had set up, and after a number of testimonials in English and Spanish, they broke into a medley of the songs for which Bill Stair, the best musician in the bunch, had for so many years provided the bass line and the heart. Memories, hugs, tears, gossip – the Etla version of an Irish wake or sitting Shiva. could in such a crowded and emotionally charged event. Three or four members of the San Pablo expat community were so distraught at the loss of their close friends and this long week of grieving that they could barely hold it together, and the comforting flowed as much from Mary to them as from them to Marry. After an hour of food and drinks and mingling, there were speeches: memories, funny anecdotes, and eulogies. From friends, from the “amaranto ladies” whom Mary and Bill had helped get started in business, from local government officials and the commissioners of the common lands, all of whom had long depended on Bill for advice and support, from the Oaxacan birding community, from the novice quilters whom Bill had tutored. 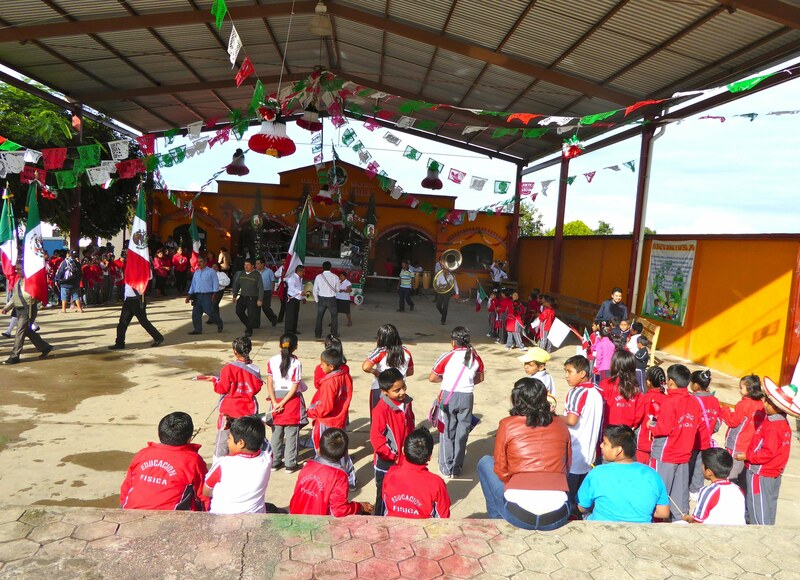 Some of the formal presentations had been prepared in both English and Spanish versions. For those that were in only one language, I offered simultaneous translation, in either direction, as best I could. The most moving eulogy was from “Doc” and Bodega Boys drummer Alberto Zamacona, who suggested that the best memorial that any of us could offer Bill would be to try to be more like him. After many hours and more music we all limped home. And then, with hardly a break to dry our eyes . . . .
We flew to Indiana for Abby and Matt’s wedding. The flight north, with the volcanoes peeking up through the clouds into the dawn light, was a balm. The three long legs of our return flight in sardine class were routinely uneventful until we started our approach to Oaxaca, where it had been raining all day. The pilot advised us to buckle up and expect a little turbulence, and a moment later FLASH!, BANG!, and we dropped like a stone for 30 or 40 meters. It seems that a lightning bolt had zapped our left wing. Plastic glasses of orange juice and mineral water flew everywhere, luggage shifted in the overhead bins, there were two or three startled gasps from passengers, the plane recovered equilibrium, the passengers likewise, the flight attendants cleaned up the mess, and we sailed decorously on through the thick clouds. The first glimpse of the ground was when our wheels touched it. As we filed out of the plane into the downpour (Oaxaca doesn’t have those covered ramps that attach to the planes), we watched a team of presumably engineers scrutinizing the left wing and shaking their heads noncommittally. Almost immediately, of course, we imagined we could hear loud shouts and the sound of fireworks going off. We were coming up on midnight, the hour of “El Grito!”, the ceremonial re-enactment of Miguel Hidalgo’s 1810 proclamation of Mexico’s Independence from Spain. This morning I walked Qalba early to an accompaniment of rockets bursting all up and down the valley, brought her home by 8:30, and went up the Agencia for the start of the parade. I don’t have a shirt in red, white, and green that says “Mexico”, so I put on my “Mexico World Cup 1998” t-shirt, like its owner a bit faded now but otherwise intact, as my gesture toward solidarity. A dais, decked out in Mexican colors, hung with dozens of tiny flags, was set up in front of the Agencia. School kids, kinder through fourth grade, dressed in their special event uniforms of red jackets, with epaulettes, and blue striped trousers, were gathering with their teachers. I greeted don Filio, the agente, don Jesús the treasurer, our friend Lázaro Montesinos Solís, the alcalde, doña Adela the teniente alcalde, don Memo, the chief of Obras públicas, and don Lupe, who wore a red, white, and green sash across his chest, to identify him as the head of this year’s Día de Independencia committee. At the other end of the covered basketball court was a flat-bed truck likewise decked out in Mexican colors. The Puro San Pablo band, 16 teen-agers with horns and clarinets and drums, was warming up in the corner. grades. It will be a short parade, as befits short legs, that winds through the village’s principal streets. Kids dress up. Village officials carry flags. The village men who are serving their cargos as policemen march in uniform, unless they have happen to soiled it in the festivities in the rain that followed last night’s Grito, as did our friend Alberto. There is a band, and a pageant truck, and plenty of fireworks. Proud parents, many of them carrying future kindergarden kids in their arms, follow behind. I was, as usual, the only gringo, but I am drawing fewer quizzical looks than I used to. 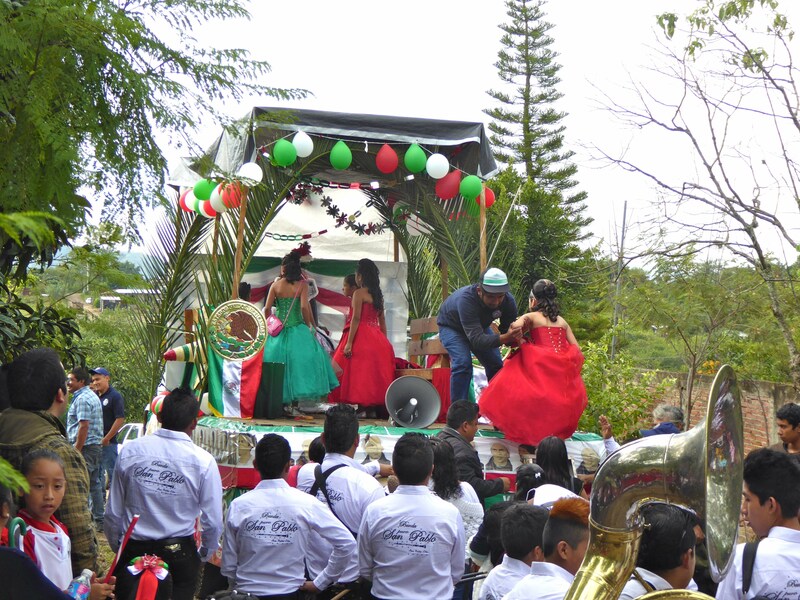 With the band blaring, intermittently in tune, we followed the pageant truck up Calle Independencia, Santa Cruz’s principal and only asphalted road. For the first couple of hundred meters the kids maintained a semblance of order, marching in step as best they were able. A few wore broad-brimmed old-time sombreros, and a few of the girls carried brightly-colored sombrillas that would change their name at the first drops of rain to become umbrellas. Halfway up to the capilla of the Virgen de Juquila we turned off unexpectedly on Calle Pino Suárez, a dirt road that sloped down into an arroyo. I asked Lalo, in his policeman’s uniform, where we were going. “A la casa de la médica,” he said, and then turned away, distracted by another conversation. To the doctor’s house?, I wondered. Why would we go there? I didn’t even know we had a doctor in Santa Cruz, just a nurse who opens the clinic next to the school in the afternoon a couple of days a week. Whatever. I’ll follow along and see what happens. Yesterday it had rained all day (recall the lightning bolt), and as the road flattened out at the bottom of the gully the water had puddled and turned the surface to viscous glue. The paraders zigged and zagged, trying to step on the gravel bits, or the grass-fringed sides of the road that were treacherously spongy. I noticed that a few of the cleverer moms had taken the precaution to put on rubber boots. The road got firmer as the parade started to climb and make a left turn into the Calle Pípila. In the lulls between band sets I could hear the truck’s gears grinding. At the top of the hill was a square house at the edge of a field. I gathered that it was the doctor’s house, because the truck pulled off to one side and turned around. Evidently we would soon be retracing our steps. 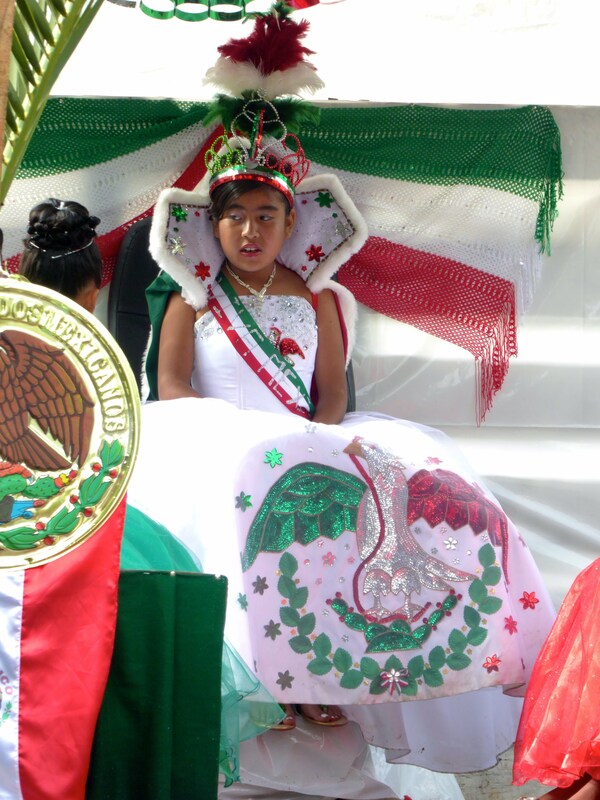 Out of the house came six girls, 10 or 11-year olds, dressed in red and green long satin skirts and blouses, and behind them a seventh girl with a voluminous white skirt on which was embroidered the cactus and eagle and serpent of the Mexican coat of arms. As the band played, officials helped the girls climb a ladder that had been placed against the back of the truck. The girl in white sat on a throne in the center, against the truck’s cab, and the others flanked her on benches. them through the village, so each year the parade route is different. The school owns the dresses, and each year assigns them to the new honorees. al sonoro rugir del cañón. with the sonorous roar of the cannon. Just the sort of song that eleven-year-old girls in taffeta would be likely to bellow. Then the truck started up again and the parade wound its way through the muck back toward the center of town, pausing at each crossroads to repeat the anthem. ¡Viva la vida! ¡Viva el amor! ¡Viva Santa Cruz! ¡Viva México!